Developed by Nintendo. Published by Nintendo. Released October 3, 2014. Available on 3DS. Copy provided by publisher. It's been six years since the last Super Smash Bros. appeared on the ridiculously successful Wii console. With over half a decade, you'd think Nintendo could come up with another word for "fight" and use it as a subtitle, alongside both Brawl and Melee. Instead, we're getting two Smash games with the most literal, self-explanatory titles in the world - Super Smash Bros. for Nintendo 3DS and Super Smash Bros. for Wii U. Can't say fairer than that, I suppose. Super Smash Bros. for Nintendo 3DS is the first to arrive, bringing Nintendo-themed violence to the pockets of good children everywhere. Though there will be a few content changes, the 3DS version of Smash is a near-identical counterpart to the Wii U version, bringing all the same characters and action - though with some obvious graphical downgrades. The good news is that, despite the 3DS' control limitations, Smash 3DS really is everything you'd expect from a Smash Bros. game in a smaller package. It's as addictive, competitive, and amusingly frustrating as it's always been, with familiar characters and new faces joining the battle to create one of the most essential 3DS games you could hope to find. Super Smash Bros., in case you didn't know somehow, is a fighting game designed for literally everybody, born in a classic "easy to learn, tough to master" mold. 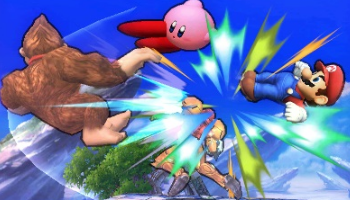 Characters from across a large library of Nintendo games (and a few non-Nintendo ones) clash in 2D stages, punching, kicking and throwing their opponents in an attempt to increase their damage percentages. The higher a character's percentage, the further they fly when they're hit, and the greater the chance of knocking them off the screen - thus eliminating them from the competition. It's like sumo wrestling, but with more fire-breathing turtle dinosaurs and electric rats. You have your standard Smash mode, where up you can play a one-off battle against up to three human or CPU-controlled opponents. It's the quick and dirty way to just start bashing stuff. Smash Run is exclusive to the 3DS version, and has you face off against minion-grade enemies in a sprawling platforming environment, earning power-ups to strengthen your character before facing off against three opponents who've been doing the same. It's a neat little mode, though the onslaught of enemies can be quite irritating at times, especially if you get the wrong combination of freezing, exploding, and impervious minions at once. Still, it's a great laugh, if only to see how many referential enemies can be packed into one map. Meanwhile, Classic mode is a single-player "campaign" where you battle your way toward series nemesis Master Hand. Pick a character, travel along a map, choosing your destination based on how tough you want the next battle to be, and unlock various rewards and coins. Here, you'll face off against the Metal and Giant fighter variants, and it's where you'll do most of your character unlocking. In addition to these game types, All-Star mode runs you through the roster of fighters with set battle conditions, while the Stadium gives you a Home-run contest (beat on a punching bag to raise its damage percentage, then see how far you can hit it), Target Blast (smack a bomb into targets, Angry Birds style) and my personal favorite, Multi-Man Smash, a mode that pits you against an army of opponents in various ways, from a simple ten or 100-fighter battle, to an endless endurance run of foes. As always, these modes can be customized to include or exclude items, change time limits, tweak the damage ratio and more, allowing for a Smash experience that plays the way you want it to. If you want a fun, chaotic experience, where players can grab blue shells, fire laser guns, or gain the aid of any number of supporting characters through Assist Trophies, so be it. If you take your brawling seriously, you can play free from items and chance, relying solely on your skills while pretending to be in the Evo tournament and saying "rekt" all the time. Multiplayer is obviously a big part of the experience, and if you haven't got any friends, there's a full online mode included. While it's certainly enjoyable, and there are already millions of Japanese players to face off against, the online connection is certainly not the most reliable in the world. Those who already didn't like the idea of playing Smash over the Internet due to input lag will be thoroughly put off by what the 3DS has to offer, as the latency is quite noticeable, and the game even has to stop now and then while the connection plays catch-up. If you can overlook these issues, it's still quite a good laugh to hop online, though I'd recommend doing so only for casual play. Matchmaking is very quick, and it really only takes a few moments to jump in and get set up. You can also spectate other matches, should you be inclined more toward voyeurism than active participation, or you're just really intimidated by my superior Bowser skills. Get rekt kappa Pringles, and etcetera.